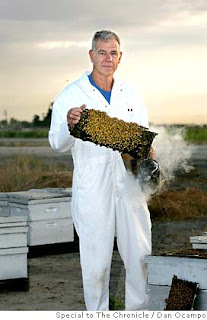 Singeli's story on bees and the almond industry was published today in the San Francisco Chronicle Sunday magazine. Singeli Agnew's article on Joe Traynor's bee brokering for apiarists and almond growers was an excellent bit of writing on a fascinating subject . I am...beekeeper who has experienced many heartbreaks the past few years as my bees have repeatedly died off, no matter what I do to keep them healthy and alive....Agnew avoided the triteness of many newspaper and magazine articles on bees and wove together, briefly and elegantly, an accurate report on modern big time beekeeping, its major players and issues, and what bees mean to each of us.